Retailers love to play follow the leader. In the US, Amazon is clearly the retail leader. In a growing number of global markets, Amazon is a force to be reckoned with. Consider the growth of Amazon’s Global Selling program, which enables sellers to sell products across national borders. According to Jeff Bezos’ Annual Letter to Shareholders, Amazon’s Global Selling program grew by over 50% in 2017. The Global E-Commerce Leaders Forum (GELF) and Internet Retailer have collaborated over the past decade to track the rise of cross-border and international ecommerce. Not long ago, it was mostly global brands that sold in multiple markets around the world. That is no longer true. Ecommerce has been the retail industry’s “great equalizer” – facilitating the growth of retail brands large and small. Today, cross-border ecommerce sales by SMBs selling via Amazon represents more than 25% of total third-party sales on the Amazon marketplace. Over 300,000 U.S.-based SMBs started selling on Amazon in 2017, and Fulfillment by Amazon shipped billions of items for SMBs worldwide. The GELF/IR international ecommerce survey includes retail brands of all shapes and sizes. Our teams are working hard to include as many retail brands as possible in this study, so please complete the survey and encourage your industry colleagues to join this important benchmarking effort. One lucky survey participant will win a free four-day pass to IRCE in Chicago! So … who’s selling what across intn’l borders these days? About 80% of the online retail brands surveyed to date tell us that they now sell to online shoppers outside their home country. About half of these ecommerce brands have been selling internationally for over five years, so there is no shortage of cross-border ecommerce lessons-learned to be shared. What does an early glimpse of the IR/GELF data show us? For one, cross-border ecommerce models remain the most popular sales model. Sixty percent of online retailers we surveyed ship orders to consumers in other countries, primarily from their US/domestic fulfillment centers. Many of these merchants and brands are also selling direct-to-consumer via localized in-country ecommerce operations (52% list this choice as one of their international sales channels) and international marketplaces (35%). The early data tells us that international ecommerce portfolio strategies including all three digital channels will become the norm over time. Retail brands will use a mix of business models to match international market sizing and acceptable risk levels. Retail has always been local. But in the digital age, its abundantly clear that retail leaders must also be global. Many global ecommerce leaders tell us that they see sales to online shoppers beyond their home borders growing at 25% annually. The initial data suggest almost 30% of respondents to date are growing more than 25% and just under one-half (48%) indicate an international growth rate of at least 15%. Compare this growth to Amazon’s international sales, which grew 34% in Q1 ’18 to $14.8 billion. Although some leaders are keeping up with Amazon’s international growth, there is still much work to be done for many retail brands. International is taking a bigger share of the overall ecommerce action too. 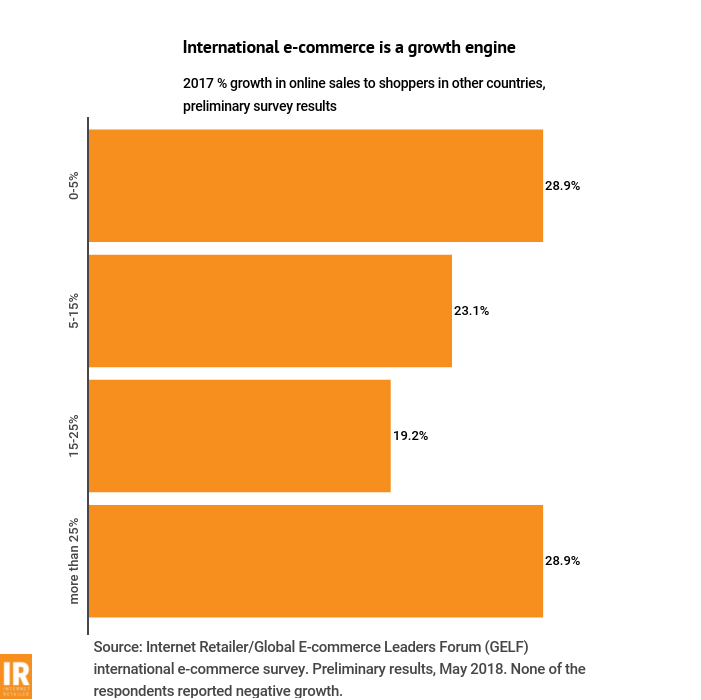 Over 35% of ecommerce leaders have found that their international ecommerce revenues now represent more than 20% of their overall ecommerce revenues. Many of these companies have invested in going global for years. However, there are plenty of “newbies” when it comes to selling cross-border. In fact, our data suggests that almost 40% of online retailers have been selling internationally for less than three years. Newbies face plenty of challenges of course. To match the impressive growth rates of more seasoned cross-border traders, they must tackle local regulations/laws, shipping and fulfillment, customs and duties and marketing/demand creation – the top four challenges faced by our survey participants so far. Retail brands that have ventured into international waters know well the breadth of issues and challenges they must solve for. Language and cultural nuances are increasingly vexing, especially when coupled with the lack of experience, insights and competitive intelligence on local markets in other countries. Many challenges mentioned by the survey participants skew towards operational issues. This initial finding is no surprise; IR/GELF research has noted this tendency since we started surveying retail leaders over a decade ago. Get Involved and Stay Tuned! Our survey is live and waiting for your team to weigh in with your experiences to date with cross-border and international ecommerce. In our next update, we’ll provide some additional international ecommerce insights from a geographic perspective. But we need help! Please join us by completing the survey and spreading the word! Survey participants will also receive a free summary version of the study’s findings and will be eligible for complimentary VIP retailer-only pass to GELF NYC ’18, which is September 27th. If you are an online retailers or brand selling direct-to-consumer, you can register for GELF NYC ’18 here. Whether your organization is “just building the business case” or whether “international is one of your top priorities,” we know that international expansion is not easy. But the retail brands that are committed to global ecommerce tell they’ve accepted that risks and the hard work ahead because they know the upside is huge. And quite likely, the best path to survival in today’s global marketplace. P.S. Don’t forget! One lucky survey participant will win a free four-day pass to IRCE in Chicago!